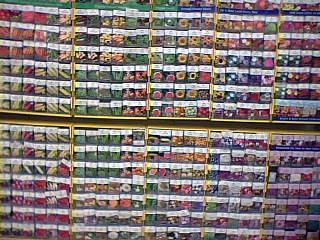 This is a picture I took in front of my happy place–the seed aisle. I love shopping for seeds. The packages are so colorful, offering hope of beautiful and delicious home grown vegetables. I could spend hours (and sometimes do!) debating between varieties of cucumbers, green beans, and tomatoes. Before you head to the store to buy anything, organize your seeds–then take your list, leave any kids at home, and have an enjoyable and productive trip to the seed aisle! Step 1: Review your garden plan. Step 2: Gather all your seeds. Square foot gardening uses so few seeds that one package can last for several years. Store them in an airtight container in a cool, dry place. Step 3: Decide which seeds you do not want–give them away! Step 4: Review seeds you will use, and organize them by planting schedule. Step 5: Identify seeds you need, create a list to take to the store. In this video I show how to use my Planting by Color e-book to organize your seeds. You can create a gardening binder and use sheet protectors to protect the pages and organize the seeds according to when you will be planting them. Wow, I love the Great way to organize the seeds! I don’t know where you live, so it’s hard for me to say. But my general philosophy is, it might be too early, but it’s probably not too late. You may not have great luck or get a huge harvest, but I think some peas are better than no peas. Some spinach better than none. If you are Yellow, Green, Blue, or Violet groups, I think you’re quite safe. If you are Orange or Red, it may really be too late. Just try, and start a little earlier next year! Just found you and all ready love ya! I finally posted about your website! And I posted the pictures of my backyard so you can see how much work I have to do! You should take a look, it’s pretty intimidating. But, I think I took the first step and admitted I need to do something about it! Wish me luck! P.S. That seed aisle looks like a lot of fun! quick question. i cannot get my garden boxes finished until next week (May 1). Will it be too late at that point to plant peas, lettuce, radishes, spinach? thanks! Emily, I have exactly the same problem. I’ll just stare and debate my seed options for hours. That’s why I really like seed catalogs. I can at least debate seed choices from the privacy and comfort of my own home. Another thing I like to do is get a group together and compare what everyone is getting, you can usually cut your seed shopping cart in half and trade seeds that you have with others that have seeds that you want. Lowers the costs, increases your number of friends. And later on the gardening season you can swap notes on how your plants are doing. A win, win, win scenario. I also LOVE the seed aisle! Isn’t gardening season great! !